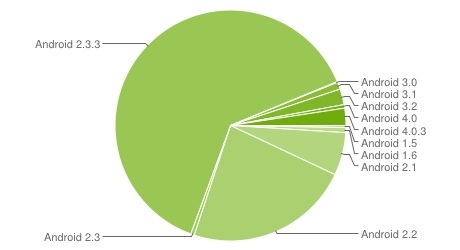 Finally there seems to be an increase in the share of Android 4.0 Ice Cream Sandwich in the Android world. Last time, when we saw the Android distribution chart, Android ICS which includes Android 4.0, 4.0.2 and 4.0.3 was running on less than 1% of all the Android devices out there. But this percentage has risen to 2.9%, thanks to the ICS upgrade reaching devices like the Samsung Galaxy S II and HTC Sensation. On the other hand, Android 2.3 Gingerbread is still the king with about 63.7% of all Android devices running on the Gingerbread family. Now this may be a big concern for Google as this is turning out to be fragmentation of the OS in the Android world. The Android 3.X Honeycomb OS is dying soon with only 3.3% of all Android tablets out there. While Android 2.2 Froyo still holds a strong position behind Gingerbread with 23.1% of all the Android devices. It’ll be interesting to see how Google plans out to spread the ICS upgrade to all devices as We are already hearing about the Android 5.0 Jelly Bean OS coming out very soon this year.